Read the first chapter, then run out and buy your own copy! I’m pretty excited about this one. As I said before, this is my 16th published full-length novel in just over 6 years (plus a wide variety, at this point, of novellas, short stories and comic books o.O), and it’s the brief reprieve of having everything I’ve completed a contract for actually being on the shelves at once. It’s also kind of the breaking point of “Catie is backing off now” (though I realize with the various crowdfunding projects it doesn’t really look like that), and thus is a significant psychological book release for me too. Grabbed my copy today, I'm so ridiculously excited! You know, last time you said you were backing off you gave birth. I'm still not convinced that that counts as 'backing off'. I'll be at the bookstore in the next week to buy this one. 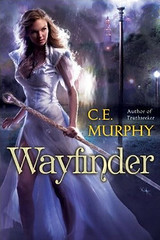 Yay Wayfinder! There's something wrong with that cover. She's fully clothed, doesn't have a tramp stamp, and her head isn't chopped off.